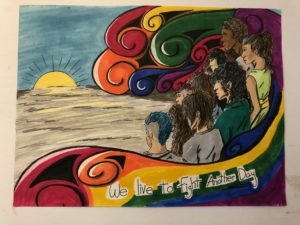 On Saturday, March 10th, San Diego Pride, in partner with Art of Pride and The Trevor Project, hosted their second annual LGBTQ+ youth art show. This year, our youth asked for the Youth Art Show’s theme to be “Revolutionary” a look at the LGBTQ revolution through the eyes of young LGBTQ artists. The work that has been brought in is deep, compelling, and inspiring. 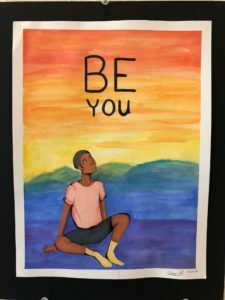 Twenty-five pieces were submitted by 23 LGBTQ+ artists from 16 different schools. “When done with intention, the use of art, poetry, and music can truly be a revolutionary act. 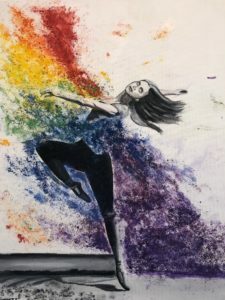 Creating civic and artistic spaces where the LGBTQ community can be comfortably and authentically themselves is a social justice issue.” said Fernando Lopez, Executive Director of San Diego Pride. From 6pm to 8pm, over 100 art lovers, family, friends and fans visited the art show located at the San Diego Pride office. This program is youth-led with junior-high to high school aged youth serving as presenters, greeters, collection donations, plus supplying snacks & refreshments. 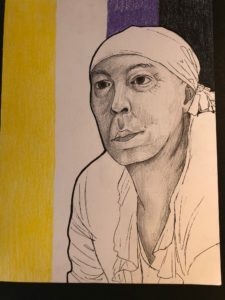 New to this year’s event was an interactive art piece where attendees of all ages were asked to create an artist trading card of what the word revolutionary means to them. “As an LGBTQ+ artist, this show gives me a sense of pride, and it allows me to express myself in a way I find comfortable. 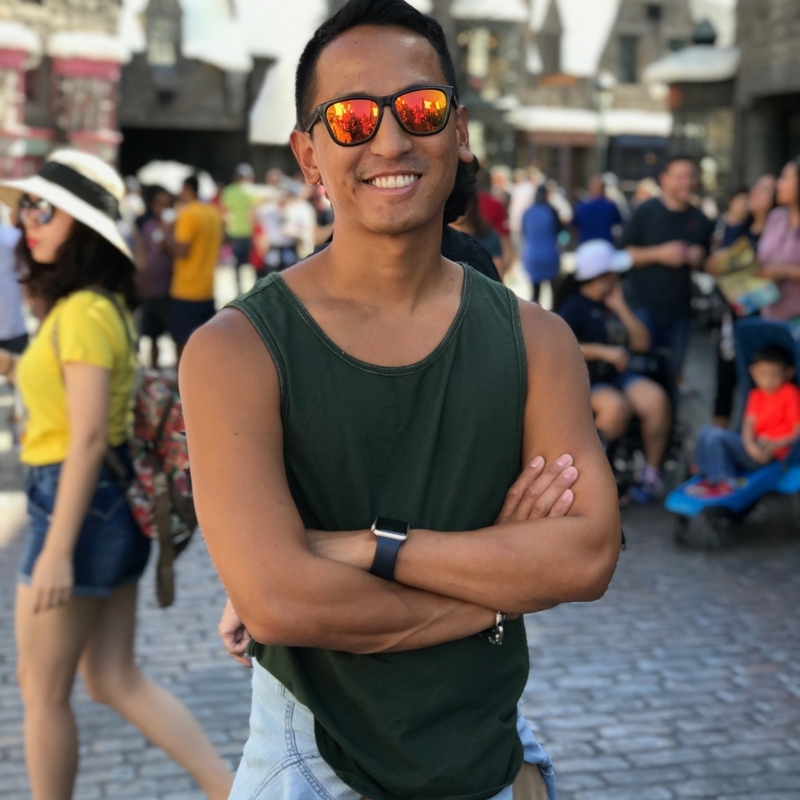 It’s also very inspiring seeing many other youths like me showcase their interpretations of the show’s theme, all in breathtaking ways,” said Sam Palma, an 18-year-old Morse High School student. Pride’s youth programs including our youth zone at the Pride Festival aren’t possible without support. If you’d like to donate to keep these programs going, please click here and select “Youth Programs”. 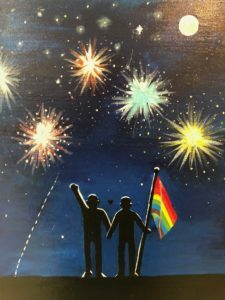 The art exhibit is available for viewing until the middle of May at the San Diego Pride office. For more information regarding San Diego LGBTQ+ Youth Programs, click here. 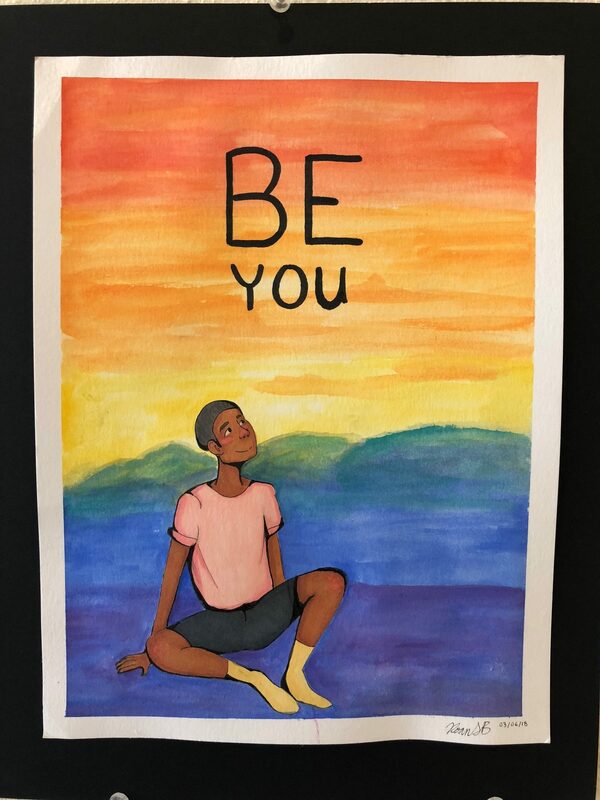 Here are a few of the many amazing pieces submitted at this year’s youth art show. Two people in a field with the Pride flag watching fireworks. My mediums for this piece consisted of acrylic paint and drawing chalk. 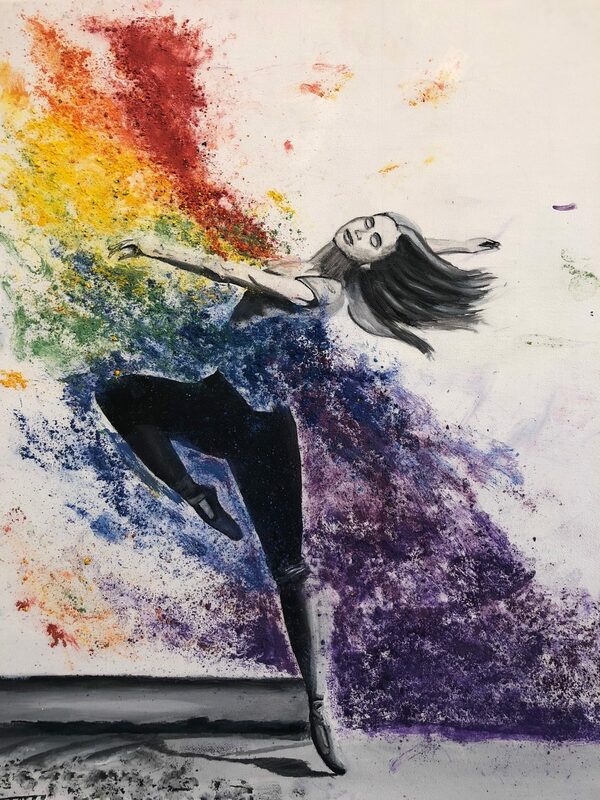 The dancing girl and the clouds of rainbow smoke is supposed to represent self revolution. After all of the bad things that happened in 2017, there were still good things that happened. 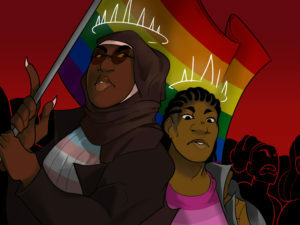 It was a year of self-discovery for some and just a year of revolution and change for people all different spectrums, and after much debating I represented that with the colors of the rainbow. A rainbow is a spectrum, so I thought it would be a good way to show support for all groups of people. A portrait of the very first legally recognized non-binary citizen, Jamie Shupe. I wanted to shed slight light on people of certain groups who are typically thrown under the bus, to show that even they are people who are relevant to LGBT groups even when undermined as they are in current society. A person sitting in front of a rainbow sunset.